If you want the best sound quality, excellent noise cancelation, and super-comfortable construction, no other headphones fit the bill better than the Sony WH-1000XM3s. The Sony WH-1000XM3 is quite possibly the perfect pair of Bluetooth headphones you can buy on the market right now. That’s a bold claim to make, we know, and normally we’d temper it with some shortcomings and caveats, but in this case, the WH-100XM3 is hard to find fault with. The sound quality is amazing, the noise-canceling is probably the best you’ll find out there, and the build quality is nothing short of magical. But, as with any purchase, there are priorities you’ll have to determine before you pull $350 out of your pocket, so let’s break it down. The previous generation of Sony’s noise-canceling headphones (the M2s) looks very similar to the 1000XM3. Both headphones look great with lots of soft lines and a delicate slanted orientation for the earcups. Many headphones in this class seat the ear cups even with the headband, which looks great if the headphones are sitting on a table. But when the cans are on your head, the 1000XM3s have a much more pleasing, futuristic sense of motion to them. There are some differences with the M3s, most notably the soft plastic outer shell as opposed to the fabric, leather-like outers of the M2s. The other main difference is that the Sony logo and the microphone grills both have a warmer copper finish on the M3s, which wasn’t present on the M2s. It isn’t for everyone of course, but to our eyes, it makes them look more premium. You can pick up the M3s in either matte black (the more professional-looking of the two) or silver, which leans a little more beige than true silver. The case will match the color of your headphones, and is refreshingly small compared to some other Bluetooth headphones out there. Sony has made some interesting design choices even on the inside of the case, with a teardrop-shaped inner organizing section to put your cables and converters. We did find it a little cumbersome to figure out the exact folding orientation you needed for the headphones themselves to fit them inside the case, but the versatility, combined with the added mesh pocket on the outside of the case, makes these headphones great to look at and great to travel with. In keeping with the sleek design, and as expected with headphones of this level of premium build quality, the WH-1000XM3 is an absolute dream to wear. While most headphones pack solid foam inside plush, leather-like fabric, Sony put in very airy memory foam and employ a soft, almost broken-in feeling leather. The experience of the sound on these headphones is among the best we’ve heard, barring high-end wired studio headphones. It was actually a little disconcerting when we took these out of the box for the first time because you can pinch the foam in such a way that it sinks underneath the plastic frame of the headphones. When you put these on your head, the foam forms a perfect, non-stifling mold on the outside of your ears, and, while this might differ for people with different sized ears, we found that the inside mesh covering the driver housing didn’t rub our ears either. At about 9 ounces (Sony clocks them at 8.99 ounces, and our scale confirmed this), these are among the lightest over-ear headphones we’ve ever tried. It’s basically like you’re wearing nothing. There was one drawback on the form factor, and it’s something that seems to plague a lot of over-ear headphones. After about two hours of constant, continuous use, we found there to be some heat buildup inside the ear cups. It was surprising because the foam seems so airy and breathable, but because of the angle of the ear cups, and because the foam on the top of the headband is a bit firmer for support, it seems to prioritize a solid fit over air temperature regulation. With that said, we found a slight adjustment to the headband size led to some relief here. This is a minor concern, but if you’re hoping to get extended use out of a pair of headphones, we’d recommend trying these out in a store. This is probably one of the most obvious differentiators against purchasing the 1000Xs. There are only two physical buttons (one for power, and the other that can either be mapped to noise canceling adjustment or to a voice assistant). It’s frustrating that you can’t have all three of those, so that’s a bit of a ding for us. In addition, the touch functions on the earcups (swiping up to adjust the volume, tapping to play/stop, etc.) are great on paper, but a little clunky and awkward in practice. The physical control that seemed to work the best is the Quick Attention function. 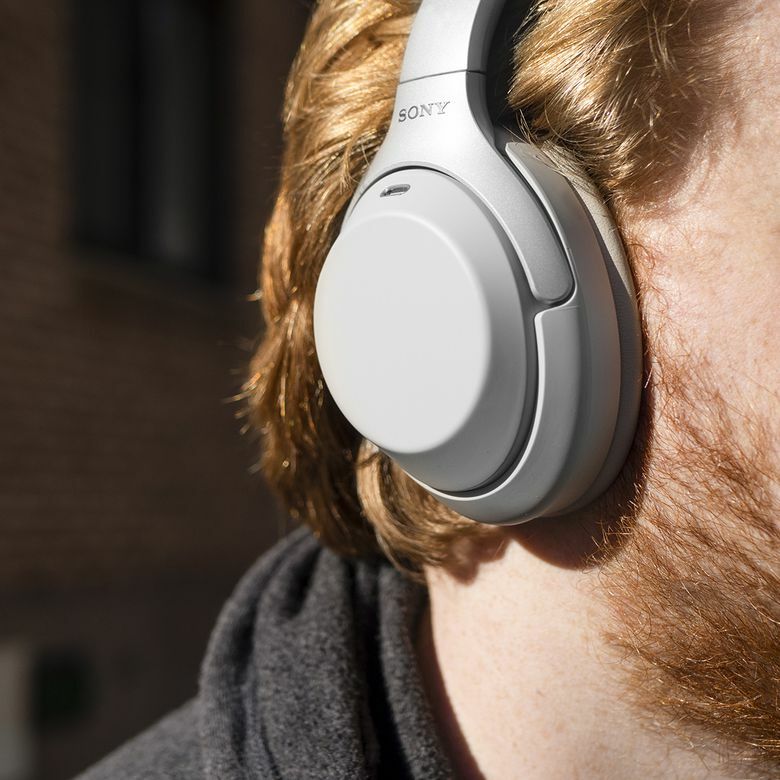 Sony allows you to place your palm over one of the entire earcups, which triggers a decrease in music volume, and will let in some outside ambiance. The goal here is to give you the option to join a conversation without having to take your headphones off. While this feature works great — we had a ton of fun covering and uncovering the earcup and see how fast it picked it up — it’s a bit of a novelty. We’d much prefer more buttons, clearer touch controls, or even dial-based systems like the Surface Headphones. When testing premium headphones, you tend to listen for what they’re missing, rather than how the overall sound comes across. In this case, we found it hard to listen that critically, because the experience of the sound on these headphones is among the best we’ve heard, barring high-end wired studio headphones. These cans sound clean. The M3’s don’t seem to heavy-handedly pump too much bass, which means that the mids and the high-end detail come through pleasantly. Sony specs state the frequency response at 4Hz–40kHz when wired, and 20Hz–20kHz when listening via Bluetooth. To put those numbers into perspectively, the theoretical frequencies that humans can hear range from 20Hz–20kHz. So the coverage is there, and with 104.5dB of sound pressure level and up to 47 ohms of impedance (when the unit is turned on), you’ll get a solid amount of power. The app is where the true star of the interfacing lies. Sony pulls this off with a closed, dynamic build, a 1.57-inch dome-type driver with a Neodymium magnet and an aluminum-coated diaphragm. To the layman, these terms mean that the speaker itself has the power and substantial build to not only handle full, balanced sound, but to most likely do so for a long time. Another great feature is that Sony has folded in basically every Bluetooth codec under the sun, from the lossiest SBD all the way to Qualcomm’s aptX HD. This means that if your device supports it, you can use a higher fidelity Bluetooth transfer protocol, and leave as much of your source audio signal intact. There’s also some proprietary Sony wizardry in the form of their DSEEHX high fidelity protocol, though we didn’t notice too much of a difference in the resolution of our sound compared with other wired high-end headphones. Whether you’re plugging these in via the gold-plated, L-shaped 3.5mm cable or using Bluetooth, these headphones sound magnificent. One of the big pillars of research for headphones on the high-end is their effectiveness in noise canceling. Something to keep in mind, as it relates to sound quality, is the noise canceling will affect the raw sound quality of the headphones. At its most basic level, active noise canceling tech use external microphones to read ambient sound around you, and then it blasts light frequencies into the headphones that cancel out that noise. Your ear hears this as noise reduction, but that means there are artifacts that didn’t exist in your original audio file. If you’re looking for these headphones to help blot out the dull roar of an airplane or find some focus in your open office, noise-cancelation can be a godsend. Right out of the box, the noise canceling is borderline disconcerting. The 1000XM3 does such a great job at silencing your room, you’ll think that your ears themselves are blocked. This is partly because Sony has included the proprietary QN1, a dedicated HD noise-canceling processor chip. What sets these ahead of other options out there is the customization. We’ll go a bit more in-depth later about the app itself, but there is a customized diagnostic you can run that will actually read the atmospheric pressure around you to determine the best level and type of noise canceling for your scenario. This is great for enclosed spaces like planes where noise might struggle to accurately cancel the plane sound without affecting your music too much. You can also customize your noise based on your head shape, hair type and even whether you’re wearing glasses. We only noticed minor differences in the canceling after reading our surroundings, but your mileage may vary, and these are flashy features to have. Add this to the ambient noise amplification options (in case you want to hear your surrounding better), with a slider to adjust the amount of ambient sound coming through, and you have a powerful set of headphones for daily use, even if you aren’t listening to any music at all. On paper, with 30 hours of promised listening time, you’d think this was just another check in the “perfect” column for the 1000XM3. If that hour mark actually held true for our uses, then we’d definitely call these the best headphones out there. But when we pushed these to their limits—listening to lots of bassy music, forcing the noise cancelation to deal with the loud street sounds of NYC, and hopping on a bunch of phone calls—we saw the battery get closer to 24 or 25 hours of use on a single charge. To be fair, that’s not bad. Some headphones at this price point can’t break 20. But, it’s a little disappointing to see such a high mark advertised, and such a substantial miss in the real world. It’s important to note that you’ll get more time if you don’t use the active noise canceling (Sony puts this figure at 38 hours). The battery charges via the included USB-C cable, which is much preferred over micro USB, and you’ll get about five hours of listening with 10–12 minutes of quick charging. In case you haven’t noticed, there’s a lot going on with the 1000XM3. The way they connect to your devices, and the accompanying app that aims to help you harness all this control, is similarly in-depth. This can be great for someone who loves diving in and exploring a device’s capability, but if you like the plug-and-play nature of something like Apple AirPods or even Microsoft's new Surface Headphones, then these might be a little too much for you. Using Bluetooth 4.2, you’ll get a solid, seamless connection to your Bluetooth devices, within a 30-foot line of sight range. Sony has also added NFC so you can quickly pair the headphones just by tapping the ear cup against your NFC device. The Sony WH-1000XM3 are quite possibly the perfect pair of Bluetooth headphones you can buy on the market right now. The app is where the true star of the interfacing lies. You can achieve Byzantine levels of customization, and even in our approximately two weeks of testing, we weren’t able to truly get all the ins and outs. The Headphones Connect app will give you some helpful information right out of the gate, like which devices you’re connected to, which Bluetooth codec is currently active, and the battery level. Below this, you’ll get to the Adaptive Sound Control Panel which will actually determine whether you’re moving or sitting stationary and adapt your sound and noise canceling level accordingly. Next up is the Noise Canceling Optimizer that lets you adjust your NC levels based on atmospheric pressure and your personal characteristics. There’s a sound position control that will actually let you pick where you want the sound to seem like it’s coming from, and even a Virtual phone technology (VPT)-based surround soundstage system. Then there are the usual sound molding options, like a graphic EQ, a toggle switch for Sony’s DSEEHX, and even the option to tell your headphones whether they should optimize sound quality or a stable connection. It is just about the most full-featured software we’ve seen bundled in with a pair of Bluetooth headphones. The standard amount for top-tier noise-canceling headphones is about $350; it’s what you’ll pay for Bose and for the new Microsoft Surface Headphones. While many products will have their hits and misses, we were shocked at just how much you get for the money with the 1000XM3. Everywhere we turned, there were bells and whistles: things like the ultra-comfy earcups, the high caliber sound quality, the insane level of control with the app, the numerous Bluetooth codecs available, and mystical amounts of noise canceling. So, while the price tag can be a bit hard to stomach for many, you most certainly get what you pay for. And that’s a lot. When Microsoft dropped the Surface headphones in late 2018, they seemed to be focusing on seamless integration with your PC and some quirky, convenient onboard controls. These features are both missing on the 1000XM3s, but on almost every other count, from noise cancelation to sound quality, Sony beats the Surface Headphones. The 1000XM3s also compete with Bose’s QuietComfort 35 (Series II) set. Its appeal comes down to brand confidence. They have a similar premium build, tons of comfort features, great noise canceling, and decent sound, but they lack the app control with the software bells and whistles of the XM3. If you love Bose, you’ll prefer the QC35 II, but we’d recommend you keep your mind open. Sony also still sells the older 1000XM2 headphones. If you already own the XM2, there aren’t enough improvement on the XM3 to recommend you upgrade. However, at the same retail price, with less customizable noise canceling and a heavier build, you probably shouldn’t buy the XM2 outright. Though, if you catch them on sale, it might be a good way to score a pair of high-quality headphones for less. Want to see some other options? Check out our picks for the best wireless headphones, the best noise-canceling headphones, and the best headphones for music lovers. Magnificent headphones with noise canceling and a bevy of other features. If you want the best, and aren’t afraid to really explore how these headphones work, the 1000XM3 are hard to beat. Product Dimensions 3 x 6.25 x 8 in.